Gliding my way around the curves of Tenth Avenue, I encounter the future star of a community’s galaxy. Tall, white, and ever so generous looking, an impressive structure leisurely stretches its wings from 172nd to 173rd. Peering past the palms, I recall a teaching of our Sages, “He who puts the doors on a house is considered to have built the entire home” (Bava Basra 53b). I realize that the building is not yet alive. Workers bustle and bang behind architectural attractiveness, but window frames and doorways appear hollow and lifeless. A valuable fortress of the spirit is begging to be born. Where, I wonder, can I find that special soul waiting to be breathed into this promising body of steel and stone? My answer lies around the corner: A well-worn path leads to a cheerful but unassuming family house. 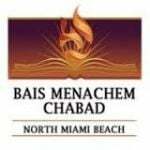 I have arrived at Bais Menachem of North Miami Beach. Within its crowded confines, I discover a welcoming and vibrant soul that fills the present setting to its maximum, even while eagerly anticipating its greater reincarnation. I immediately notice the friendly atmosphere, reflecting a youthful and family-oriented community. It is a steady hub of prayer services, family milestones, Torah classes, children’s programs, and communal gatherings. A spiritual powerhouse. However, it is an overly modest home for a communal heart, with no pretensions of aesthetics or delusions of functional space. For that, the congregants dream of the rising structure next door. The contrast between the two edifices could hardly be more striking. A dwarf has given birth to a giant, albeit with extensive doses of time and effort. The disparity accurately symbolizes the community’s explosive growth: Bais Menachem began with a nucleus of little over ten families seeking a Rav back in 1996. Under the dedicated nurture of Rabbi Yossi Marlow, the community has rapidly blossomed to over 125 families that have entirely outgrown their once cozy premises, hence the adjacent 20,000 sq. ft. hard-hat site. Trying to gaze through the hollow frames into the new building’s future, I sense promising prospects for the thriving neighborhood. What will not be included? After all, there will be men’s mikveh; a main sanctuary for over 500 congregants and a daily synagogue; a library, youth rooms, classrooms, and a spacious sukkah. In a winning fusion of spiritual and material energy and charm, the synagogue will include gardens with a fountain, a giant menorah, and a terrace under the stars that will serve as a platform for marriage ceremonies.